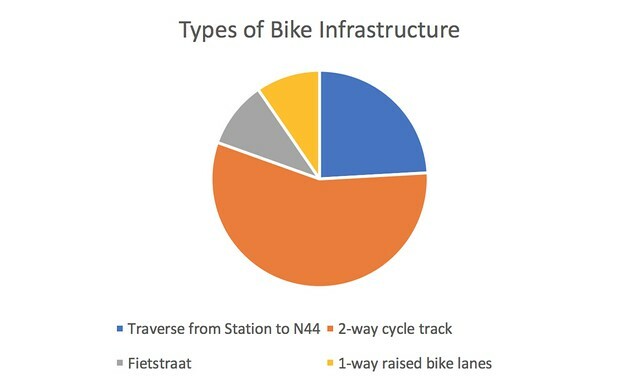 I began my route at Den Haag Centrale station, and followed the bike highway along the N44 freeway connecting The Hague to Leiden (figure 1). The path is relatively straightforward along the highway with a few diversions in order to provide safe passage to riders. The total distance travelled in one direction from the station in The Hague to Leiden was 13.15 km (8.17 mi). My overall experience on the route was very pleasant. It was extremely easy to follow, and primarily followed directly along the N44. There was one section (segment 6, figure 1) where the bike highway was diverted from the N44 and travelled through neighborhoods, but there was consistent signage and the passage soon arrived back on a separated two-way cycle track following the freeway. Before I knew it, I was crossing under the raised N44 and going into the town of Leiden. There were other times when the N44 intersected with other highways that the intersecting highways were put on top of an overpass in order to allow continuous flow for each of the highways. This does often mean, however, that traffic taking the ramp off of the perpendicular highways at this point need to cross over the bike highway and a signalized intersection was often implemented in these areas. See embedded maps for photos or each segment and piece of infrastructure. The first portion of my ride was the transition from the central train station in The Hague to the start of the bike highway along the N44. Beginning at the station, I briefly rode along a two way cycle track before entering into a wooded, extremely wide path. In general, the bricks were very rough and not pleasant to ride on, but I was impressed by the presence of streetlights along the entirety of the path. The path continued for a few kilometers down inside this area, the only interruption being to cross Laan van Nieuw Oost-Indië. This was the only point throughout the journey where I did not feel safe in crossing. I needed to cross a 2+2 main road with a median in the middle to wait. Seeing cars speed past while waiting for a gap led for a stressful interruption within the otherwise peaceful riding area. The area ended by merging onto a cycle track going eastbound on the southern side of the highway before I took an underpass beneath N44 in order to reach the bike highway on the other side. After crossing under the very wide and open underpass, I arrived at the actual bike highway on the northern side of the N44. I headed eastbound, following the arrow that pointed to Leiden. I was very impressed initially at the ability for the highway to travel alongside rushing motor vehicles without really feeling like it. The cycle track is two-way and paved with red asphalt, a dash down the middle separating the two lanes. I did not have a measuring tool at the time of a ride, but an investigation with Google Maps leads to a total lane width of just over 12 ft. This gives plenty of space for people to ride side by side, to pass by opposing bike traffic, and even to do both at the same time. As the path is only accessible to bikes, there is no need to take speed control measures for cars. There was one signalized intersection that I encountered on this stretch, at which I waited 12 seconds for a green light. After a certain period of riding on the two-way cycle track, it was transitioned into a fietstraat, which served residents with motor vehicle access to their spread out homes. This road serves no purpose as a through road, and is not necessary to take unless a destination is on the road. Because of this, it was able to be paved rather wide (14 ft. according to Google Maps) without constant speeding motor traffic. While on this road, I did not encounter a single car and yet encountered several other bicyclists. It maintained the same feeling that the separated bike highway gave me, especially due to the continuation of the red asphalt on the road. I understand the necessity of having motor vehicles being able to access this part of the bike highway and I did not feel that it detracted from the experience. After a couple of quick switches from fietstraat to cycle track to fietstraat (Segments 2a and 3a) and a signalized crossing that I did not have to wait at all for, the bike highway turned again to a two way cycle track for quite a long distance. In this stretch, the feeling was still maintained from segment 2, but the road texture changed around between red asphalt and red tiles. Although the asphalt is more comfortable to ride on, the tiles still provided a rather smooth ride. There was one signalized intersection on this stretch where I waited 0 seconds. As I approached, the light used to cross the small side road was automatically set to green for the bicyclists. Leaving the cycle track in the previous segment, I was confronted by a green light that I just missed as I approached a busy-looking commercial area. This ended up being the longest I waited at any light, totaling a time of 40 sec. After getting through the crossing, I entered onto a small stretch of fietstraat that was used to access a couple of commercial storefronts. At the end of the fietstraat, I noticed that the red pavement ended and I faced a one-way road coming towards me. At first I was a bit confused but I saw that the red pavement continued into the neighborhood with a left turn and I figured that this symbolized the continuation of the bike highway. My hypothesis proved to be correct, as I weaved through a few neighborhood streets before ending up on a street that ran parallel to N44. In this neighborhood, I was primarily running on one-way raised bike lanes. They were located between moving traffic and parked cars, which were also raised alongside with the bike lane. I was hesitant at first to the presence of bike lanes of any sort on a bike highway, but they were an extremely comfortable red asphalt with plenty of space (5 ft.) and the riding proved to be stress free. At the roundabout that I needed to pass straight through, I was given priority as a bicyclists and hardly had to slow down in my traveling. At a certain point in the neighborhood, the one way bike lanes merged into another 2-way cycle track. I had a continuous trip at this part on the ride in, but at this point going in the opposite direction I needed to cross the 1+1 lane with a median that proved very low-stress. From here, the two way cycle track took me all the way to Leiden. At one point, as the track takes its final turn into the city of Leiden, the motor highway raises up so that the bike highway and the service road it follows at this point can cross underneath it seamlessly and enter into the city. 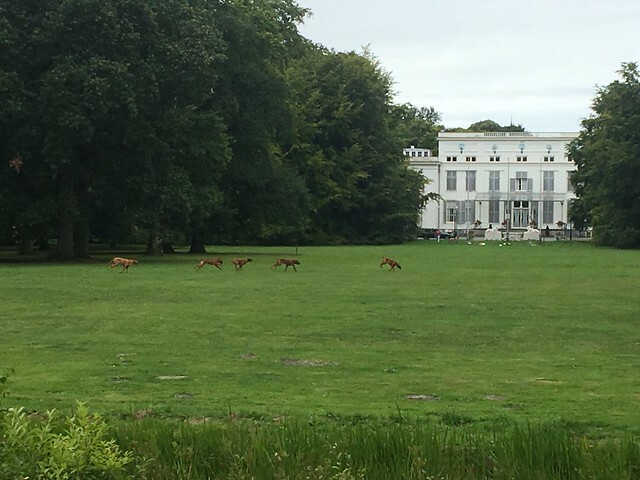 As I was passing along the fietstraat and the massive houses that it housed, I saw bunch of streaking figures on a wide lawn. After stopping to further inspect, I noticed that these figures were large dogs, all of which looked exactly alike. I saw more dogs the more that I looked including on the porch to the house. Overall, I was very happy with the journey taken on this bike highway. It was comfortable to ride on, easy to follow, well lit, and well connected. There were no spots that I felt needed to be filled in. Although this trip is longer than I would take as an everyday commute, it does a good job providing safe and easy bicycle passage from The Hague to Leiden.